It's that time of year again... a week from tomorrow is the annual Dabo Swinney Ladies Clinic held by Dabo's All In Team Foundation that raises (a lot!) of money for the Susan G. Komen breast cancer research fund. This year's event is next Saturday, July 21 from 9:00am to 4:00pm - with registration starting at 7:15am. We have gone the past two years - once as a participant - and let me tell you, this is one of the most memorable and most fun Clemson experiences you will have. It's like a big party to set the tone for the upcoming football season - AND it's all for a great, great cause. 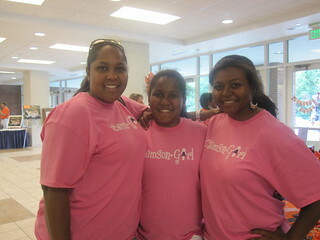 Take a look at our pictures from last year's Ladies Clinic. 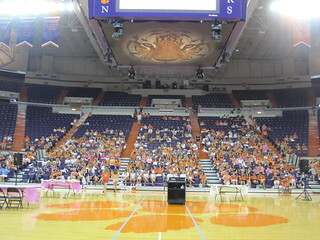 Dabo's All In Team® Foundation is partnering with AnMed Health in hosting The 2012 Dabo Swinney Ladies Clinic featuring “Lady Legends of Clemson”. The event will be held Saturday, July 21st. Check-in starts at 7:30 a.m. in Littlejohn Coliseum with the official program kicking off at 9:00 a.m. The day’s events will finish at approximately 4:00 p.m. in Death Valley. 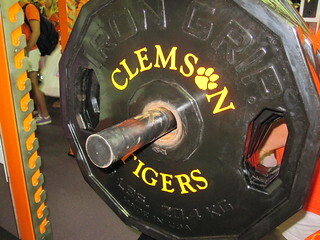 Attendees will receive instruction from the Clemson coaching staff and a behind the scene look into Tiger football. In attendance, participating in the events will be Clemson alumni Governor Nikki Haley, former CBS newscaster Jane Robelot, and others to be announced. Presentations by Coaches in the West End Zone facility including the Tiger weight room, locker room, team meeting room and Death Valley. Meet and Greet Photo w/ Coach Swinney. Interaction with all the Tiger Football Coaches and families. Shopping with Clemson Tiger vendors. Silent and Live Auction items. Special Guest Speakers and Entertainment. Registration for the entire day plus goodies and lunch is only $60 - and $15 of each registration fee is matched by Dabo’s All In Team Foundation with the proceeds going toward breast cancer prevention and research. Last year over $24,000 was raised and donated to the Susan G. Komen Foundation and AnMed Health. ClemsonGirl.com and Tickled Orange also donated almost $800 to Dabo's All In Foundation with sales from our t-shirt - designed by you. 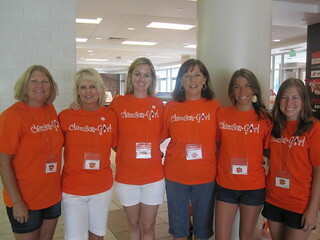 Last year we were honored that the Clemson Girl t-shirt was selected as the official t-shirt of the clinic. It was so fun seeing everyone walking around sporting the t-shirts! This year you'll find us set up at our own ClemsonGirl.com table during the "shopping" section of the clinic, and we are excited to announce that we have partnered with Jack Rogers and will be giving away a free pair of their Clemson Navajo sandals! So make sure you stop by our table and submit an entry. We'll have a pair there so you can see them in person and an order form if you want to buy a pair of your own. We will also have some other fun surprises at our table! If you're going, we can't wait to meet you! If you aren't signed up - what are you waiting for!? Visit the Ladies Clinic website and sign up! We hope to see a record crowd of Clemson Girls there!